I love to shop! I mean...who doesn't?!? One of my favorite things to shop for is kids clothing. And with four kids, that can be VERY dangerous! Although my tween and my teen have strong opinions about what they want to wear, I shop small for most of Liam and Lily's clothing. There are so many amazing small shops that promote positivity and awareness, which is EXACTLY our mission. Liam is rocking that extra chromosome, and I can only hope his infectious smile and incredible joy is helping to make this world a happier, more accepting place. 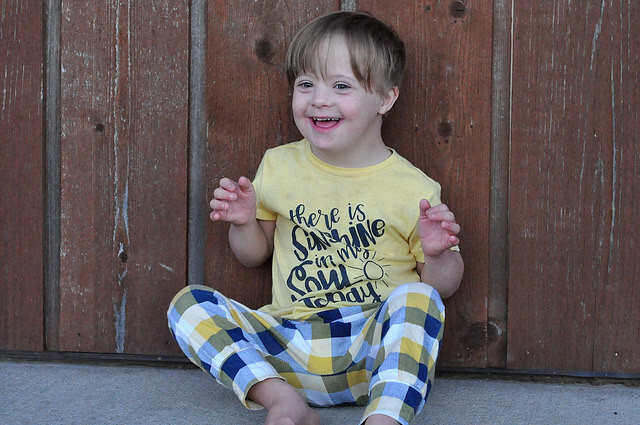 There's enough negativity in this world and misconceptions about those who are different, so I love to dress Liam in shirts that spread positivity and/or Down syndrome awareness. He has quite a wardrobe, and we always get so many compliments on his awesome shirts! Today, I'm sharing a few of our favorite small shops that promote positivity and awareness. Liam works with a couple of the shops mentioned below, and I'm sharing them because I TRULY love them. I even included a few discount codes that you can use! Happy shopping! 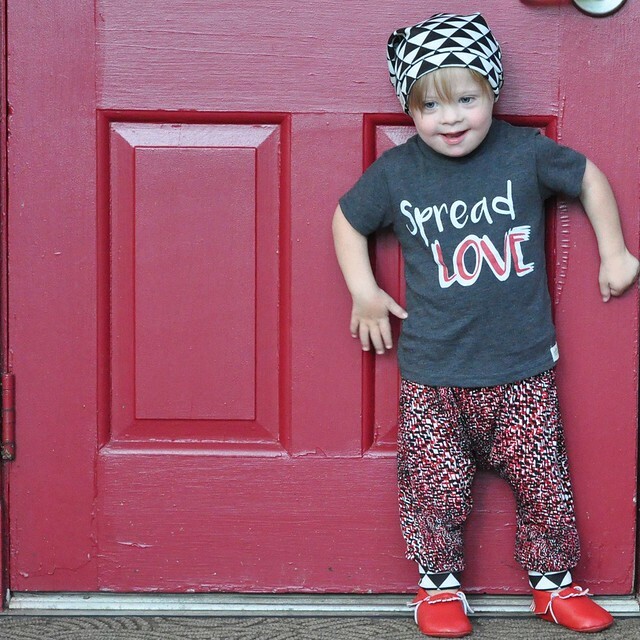 This inclusive small shop sells the best hipster gear for your little one! 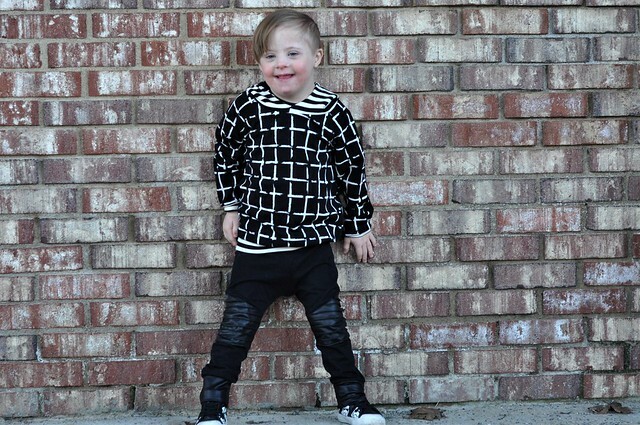 From slouchy hats, to shorts and leggings, to rompers, to custom name items, to inspiring shirts, and everything in between, Trendy Bubs has something for everyone. Although the sizes mostly range from birth through 4T, their accessories are perfect for older kids (and even adults), too. They have a few cute options for mom and dad, as well! When I say inclusive, I truly mean inclusive. 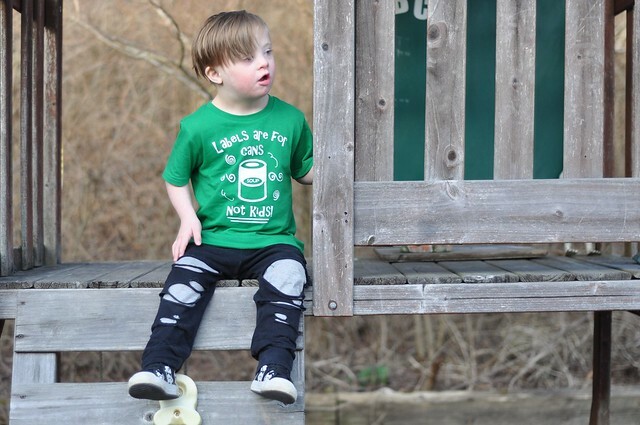 The shop owners go above and beyond to include kids of ALL abilities wearing their clothing, including Liam. The two owners, Karla and Emily, are the SWEETEST shop owners we have ever worked with, and they will happily customize any item if you just ask! Join the Trendy Bubs VIP Facebook page to keep up with new releases and current sales! It's not just the positive shirts that we love. Most of Liam's pants, joggers and shorts come from this shop, too! Use the code liamff to save 20% (excluding sale and custom name items) at checkout! We recently discovered this awesome small shop. If you are looking for positive, inspiring, or awareness shirts for people of all ages, this is the place to go! Se7enTees has so many amazing shirts that I kind of want them all for my entire family! Se7enTees offers a Color Collection, Everyday Collection, Awareness Collection, Positivity Collection, and a Holiday Collection. They also sell shirts for adults, socks, and they offer upgrades like neon colors, long sleeves or hoodies. You can join Se7enTees VIP Facebook Group to see their new releases first, and get special discounts. Enter LIAM15 at checkout to save 15% on your order! 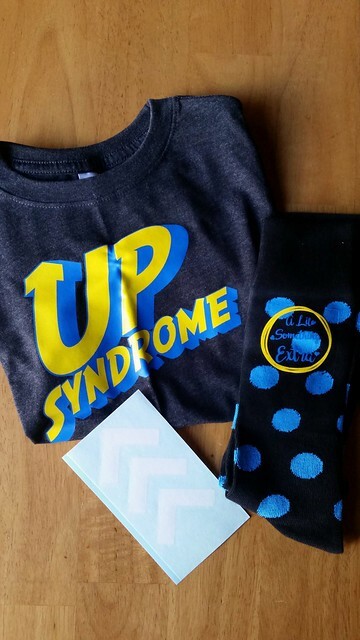 A Lil Something Extra sells Down syndrome awareness and adoption awareness clothing. They have a little bit of everything: shirts, dresses, bags, hats, jewelry, decals, pop sockets, drinkware, wall art and money clips! Even better, they give back! The shop owners adopted a child with Down syndrome, so each month, they give a donation to a family who is trying to adopt a child, or to Reese's Rainbow. They also ssupport Ruby's Rainbow, Gigi's Playhouse, and Ronald McDonald House Charities. 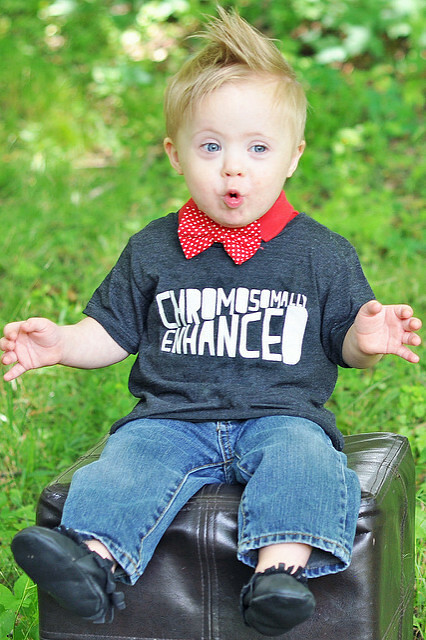 I absolutely love this Down syndrome awareness shop! 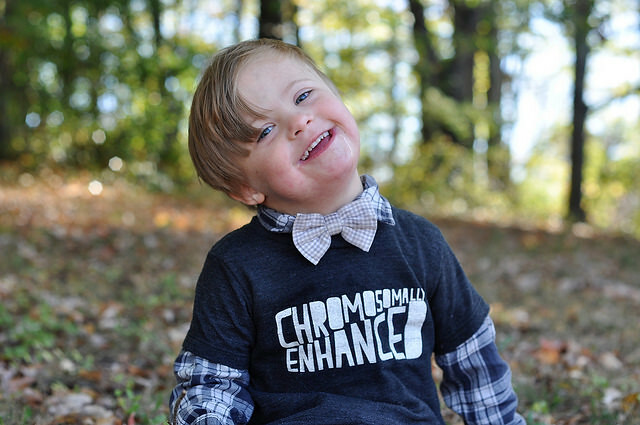 Their Homie with an Extra Chromie and I Love Homies with Extra Chromies shirts are my absolute favorites! Reeve's Tees mission is to help others get comfortable with difference, and they do it quite well! 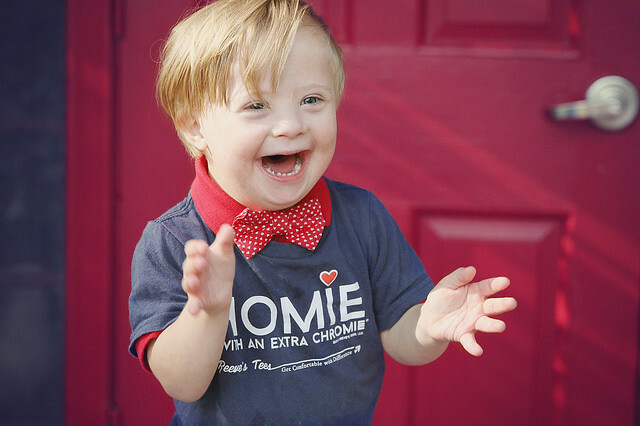 The shop owners have a a child who has Down syndrome, and they promote Down syndrome awareness in such a sweet, light-hearted way! But what makes this shop truly shine is the fact that they employ people who have special needs! Seriously...you HAVE to meet their team! 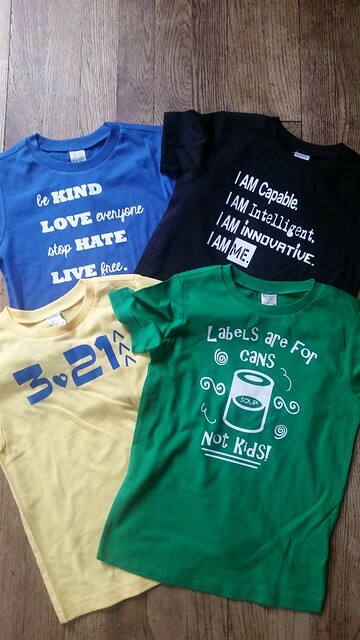 Littlest Warrior sells some of our most favorite shirts! They are known for their Holland Tour Guide and Holland Tourist shirts, but they have so much more to offer. (Welcome to Holland, anyone? 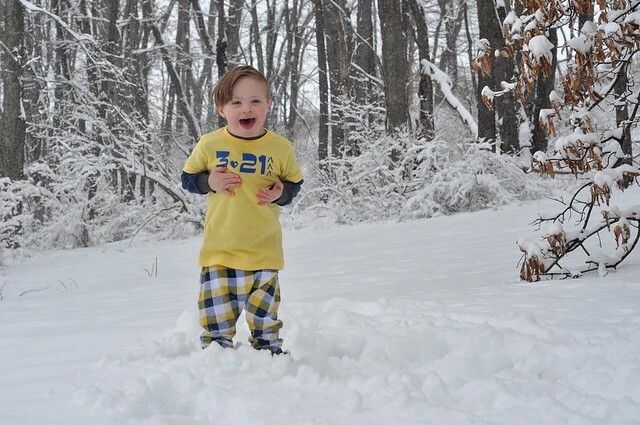 )We love them so much that I keep reordering the same shirts in bigger sizes for Liam! Can I get one of everything, please?!? 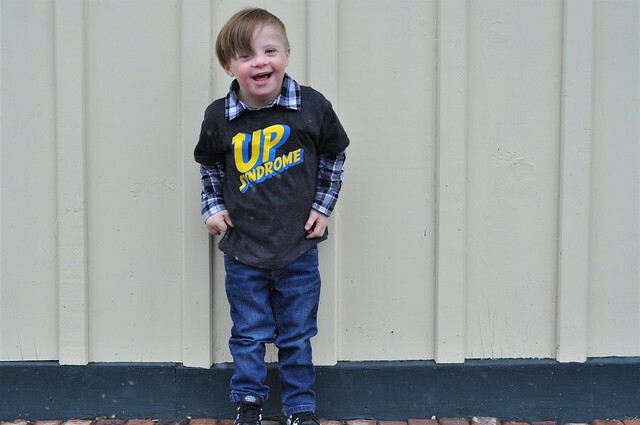 The shop owner, Michelle, started Littlest Warrior Apparel after her son was born with Down syndrome, to promote Down syndrome awareness and inclusion. The shop eventually expanded to include so much more, including CP awareness, Cleft Warrior, Epilepsy Warrior, Gotcha Day, Spina Bifida Warrior, and Heart Warrior. If you're looking for a shirt to raise awareness about something, they most likely have it. They also have one of the best selections of inclusion shirts that I've ever found! 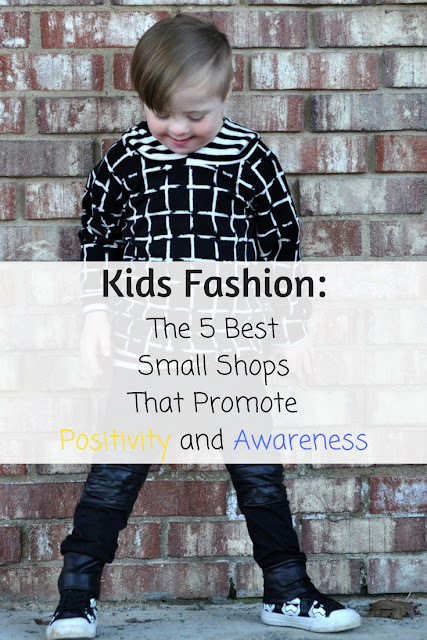 I hope you have fun checking out our five favorite POSITIVE and INCLUSIVE small shops, and hopefully doing a little shopping for your kids (or yourself)! 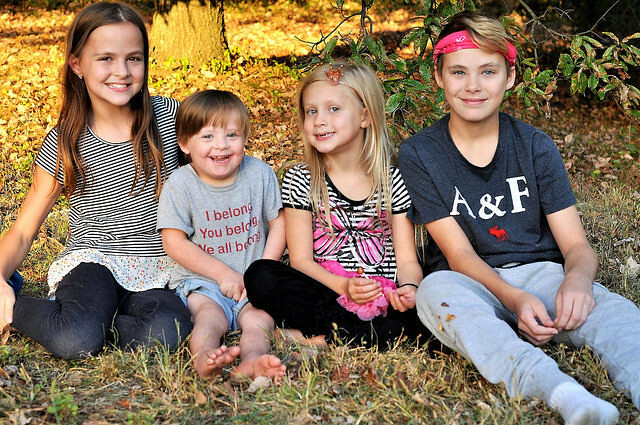 I always tell my kids to spread love and kindness every day and be proud of who they are, and these small shops offer clothing that is a perfect fit for my happy crew! It was difficult to narrow this list down to just five of our favorites! I would love to hear what YOUR favorite small shops are! Maybe we've heard of them, maybe not. Either way, I love to find new small shops to support. Leave yours in the comments! These are great! 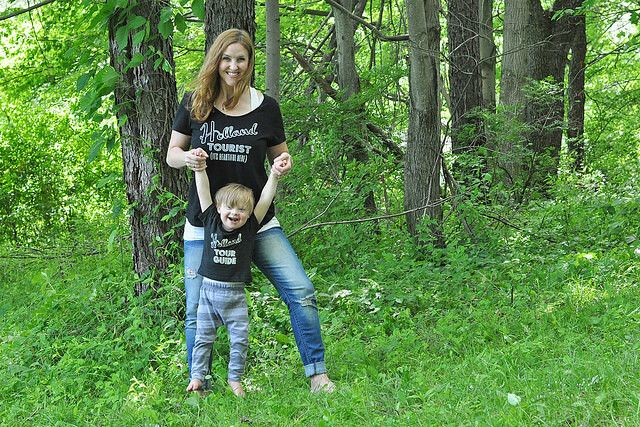 Have you seen that Cents of Style has a shirt that says Nothing Down About It?